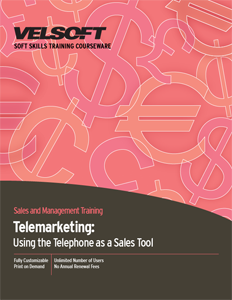 Telemarketing Training Materials are designed for trainers to teach employees how use a telephone as a sales tool. Develop verbal communication skills, how to serve and delight customers, enhance active listening skills and more! Seeing is Believing This sample manual to teach Telemarketing is in MS Word format. Sales professionals face a lot of difficulties when it comes to selling over the phone: the daunting prospect of cold calling, being warded off by gate keepers, not being able to reach the right people, and leaving voicemails that are rarely returned are all barriers to successful telesales. If you’re a trainer who’s been in search of training material that covers all of these common barriers and provides the top telemarketing techniques. Velsoft’s Telemarketing Training Materials use up-to-date methods to help the professional sales person make effective calls, speak to the right people, and get their calls returned. By applying specific relationship building strategies, setting achievable, measurable goals, your participants have the potential to accelerate their results. Telemarketing Training Materials are available through Velsoft’s eLearning website, meaning trainers can deliver a unique and interactive blended learning solution that enables students to learn the material and develop their telemarketing strategies at their own pace and make the most of their time!